Magnesium and magnesium alloys offer a wealth of valuable properties, making them of great interest for use across a wide range of fields. This has led to extensive research focused on understanding the properties of magnesium and how these can be controlled during processing. 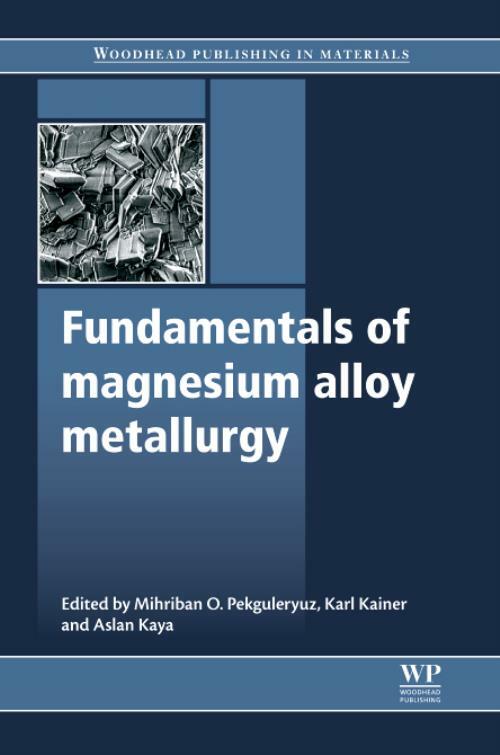 Fundamentals of magnesium alloy metallurgy presents an authoritative overview of all aspects of magnesium alloy metallurgy, including physical metallurgy, deformation, corrosion and applications. Beginning with an introduction to the primary production of magnesium, the book goes on to discuss physical metallurgy of magnesium and thermodynamic properties of magnesium alloys. Further chapters focus on understanding precipitation processes of magnesium alloys, alloying behaviour of magnesium, and alloy design. The formation, corrosion and surface finishing of magnesium and its alloys are reviewed, before Fundamentals of magnesium alloy metallurgy concludes by exploring applications across a range of fields. Aerospace, automotive and other structural applications of magnesium are considered, followed by magnesium-based metal matrix composites and the use of magnesium in medical applications. With its distinguished editors and international team of expert contributors, Fundamentals of magnesium alloy metallurgy is a comprehensive tool for all those involved in the production and application of magnesium and its alloys, including manufacturers, welders, heat-treatment and coating companies, engineers, metallurgists, researchers, designers and scientists working with these important materials. Pekguleryuz, Mihriban OMihriban O. Pekguleryuz is Professor in the Light Metals Research Lab at McGill University, Canada. Kaya, A. ArslanDr. Ali Arslan Kaya is Full Professor of Metallurgy and Materials Engineering, and Head and founder of the Metallurgy and Materials Engineering Department of Mugla University, Turkey.